In my circles, there has been a lot of discussion swirling around Wednesday’s Los Angeles Times article, Billions spent, but fewer people are using public transportation in Southern California, by Laura Nelson and Dan Weikel. The Times’ authors cast a disparaging light on recent downturns in ridership: “Despite a $9-billion investment in new light rail and subway lines, Metro now has fewer boardings than it did three decades ago, when buses were the county’s only transit option.” The article further asserts a number of causes for declining ridership including “a changing job market, falling gas prices, fare increases, declining immigration and the growing popularity of other transportation options, including bicycling and ride-hailing companies” and also immigration patterns and new drivers licenses for the undocumented. Steve Hymon at Metro’s The Source, responds citing national trends and touting transit’s promising future, though Hymon ultimately concludes that Metro can do better. KCRW’s Which Way L.A.? hosted a discussion with Loren Kaye, Denny Zane, and Brian Taylor. Taylor blames a lack of agreement on policy goals that results in a “distorted” system that favors cheap car travel. 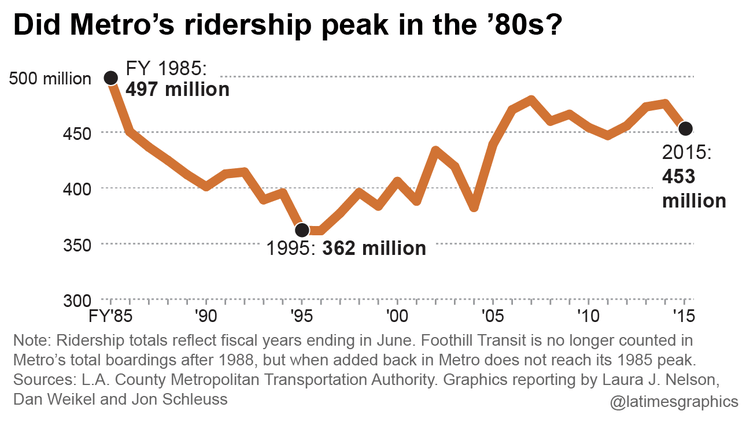 Railtown author Ethan Elkind notes that the Times graphic misleadingly emphasizes Metro’s 1985 peak ridership. Jarrett Walker criticizes the Times for identifying an “accelerating” trend out of what is actually “very noisy” but largely flat ridership data. Walker emphasizes that the current one-year decline in ridership is not a “trend” yet; labeling it one is presumptuous. Matt Tinoco at LAist echoes Elkind and Hymon and questions the role of changing demographics, including gentrification in L.A.’s core. At yesterday’s Metro board meeting, CEO Phil Washington asserted that transit ridership is cyclical and that L.A.’s decline is in line with national trends. He also stated that he would be responding via a planned Times guest editorial. There are a lot of keystrokes already stricken on this, but, nonetheless, I’d like to weigh in with some ideas and some questions, and to further hear from SBLA readers on what you think. Like the Times list, I don’t think that there is one smoking gun cause, but plenty of interacting and overlapping factors that influence ridership. My first thought upon reading the article was to blame declining ridership on a disparity of investment between transit infrastructure and car infrastructure. The U.S., California, and Los Angeles continue a long pattern of spending huge budgets to support driving, and not so much for transit. Governmental regulations, including parking requirements, also require massive private investment to serve cars, with little to no provisions for transit. Collectively, we pay people to drive, and so people drive a lot. I am skeptical that even Measure R’s significant transit investments will move L.A. County toward a greater transit share because Measure R also provides billions of dollars for highway and road expansion. But spending on new lines is not enough. Increases in transit use are only possible when the low costs of driving and parking are addressed, and when government and private partners work together to develop more densely near transit stations. None of the cities that built new light rail lines in the 1980s understood this reality sufficiently. Each region also built free highways during the period … These conflicting policies had as much to do with light rail’s mediocre outcomes as the trains themselves — if not more. Compared to steep bus ridership declines in neighboring Orange County, Metro’s success in keeping ridership declines minimal can be seen as a success story. Metro was able to stave off more severe service cuts and greater fare increases due to Measure R. This brings to mind the futility in the Red Queen’s statement to Alice in Wonderland: “Now here, you see, it takes all the running you can do, to keep in the same place.” Metro is expanding rail transit (and highways) as fast as it can, but its bus service remains largely unchanged, and therefore declines as public subsidies prioritize other modes. The Times article does review earlier events, but the article names and critiques Measure R (2008) and a future R2.1 which is expected to go before voters in November, 2016. It is possible to be critical of Metro’s priorities, but probably not Measure R itself. At least not yet. There is a long lag time for massive capital projects, so the rail that Measure R is building is just not done yet. The first Measure R-funded rail line will open in March, and the second opens in May. Metro has been operating under earlier sales tax measures – Prop C (1990) and Prop A (1980). There is a longer-term case to be made that when Metro focuses on rail building (since the mid-1980s) that other modes suffer, more on this below. Since at least 2008, when Measure R passed, the push to expand Metro rail has meant bus service has been flat, slightly declining through twice-yearly “service adjustments” and declining slightly in proportion to population growth. Especially since 2008, Metro’s top priority has been an accelerated rail construction schedule. This has, as I say, sucked the air out of the room. Bus service has declined slightly since 2008 (with no new rail mileage yet), resulting in a corresponding slight decline in ridership. If Metro is not going to expand its bus service (I wish it would, but that will take political will), then it will need to run bus service as efficiently and effectively as possible. Public transit expert Jarrett Walker stresses the importance of running a frequent service network, which will “serve more people without more money.” This is exactly what Metro is planning to do this June, with its Strategic Bus Network Plan. There are a lot of details still to be finalized, but that should be a small positive step forward for bus ridership. Another huge bus ridership factor is fares. Metro’s peak ridership periods correspond to periods of low fares. The last year of declines is in part attributable to September 2014 fare increases. If Metro’s goal is solely to expand ridership (and it isn’t) then Metro needs to go back to basics and pay as much attention to its core bus service as it does to its “shiny new” rail service. It is not possible to lower fares and greatly increase service, but if the agency is prudent fiscally, it can and should incrementally grow its bus service, keep fares as low as possible, and reap increased ridership. Metro’s budget analysis showed very little correlation with gas prices. Other analysis finds a greater correlation. With gas prices currently in unusually strong decline, this previously weak factor is likely helping pull ridership downward, too. In the longer term, Metro ridership is fairly flat; for about a year and half, it has declined. Ridership is influenced by a host of factors. Some of these are outside Metro’s control, including gas prices and national transportation funding. Some of these are controlled by Metro, including fares and service. Metro’s goal is to convert 20% to 25% of the county’s population into regular transit riders. Unfortunately, according to Census data (specifically, American Community Survey data), L.A. County transit commute share hovers just above 7 percent. Metro should be setting mode share goals (what percent of transit riders do we want? ), reporting on them, and tailoring investments to realize goals. This is difficult to change abruptly, with lots of road funding embedded in Measure R, but the agency does have discretionary funds, and can and should shape the next sales tax measure with Washington’s stated goal in mind. What do you think, readers? What’s causing Metro’s ridership decline and what should Metro be doing to increase ridership? On Twitter one of the authors of the Times article retweeted a commenter who said people don’t feel safe on Metro because there’s no police presence. I disagreed and mentioned crime in Los Angeles was down to lowest levels in decades. The Times author responded saying my info was old and that crime “spiked” in Los Angeles last year. My point is the article, like the author’s response to me, plays fast and loose with data to observe a so-called trend. Policing is probably a factor. If Metro can improve a lot of smallish things (policing, wifi) and some big things (frequency, stops) it should result in ridership gains. – No rail or BRT route available (job located far from good transit). – It takes two buses, the second of which runs only once every 40 minutes. – Free parking at work (isn’t that in the Bill of Rights?). – Takes 2 hours each way by bus/walking versus 45 minutes by car (driving is fast, there are tons of freeways thanks to decades of federal investment). – I can afford a car and I have a place to park it at home (like most people in LA County). – Moving closer to work means moving farther from my wife’s job (it’s easier to pick a transit-rich location if you have money and you are single). – Environmental guilt over driving versus 2.5 additional hours of travel time every day, followed by thoughts like “even if I did this, almost nobody else with a choice would and global warming/smog would still be happening.” (Guilt isn’t enough, most people will do what works for them). The main things that would get me out of my car are better bus frequency and having to pay for parking at work. Unfortunately neither seems to be on the horizon in my case. Better bus frequency either requires more bus funding or higher density of development along the route through some pretty suburban areas (both of which I would be in favor of). I really don’t understand this hand-wringing about expanding the system while ridership is fallen. For starters, two big Metro expansions coming online this year aren’t even open yet. The rail system that’s available *right now* doesn’t really go anywhere in terms of the percentage of LA covered by it. Transit has to actually go places that people want to go to get ridership. On top of that, it has to do it in an amount of time that’s at worst a wash with driving (since taking transit is cheaper). Bus rides are worse than driving even in rush hour because you’re not just sitting in the same traffic as everyone else, you’re constantly pulling in and out of it. To go to the SFV stops along the Orange Line from Santa Monica once the Expo extension opens, you’d have to spend 45 minutes going the wrong way into DTL; switch to the Red Line and backtrack; and then switch again to the Orange Line. This is going to take at least 1.5 hours even assuming you never have to wait for your train/bus at any of the three stations you have to deal with. Honestly, I have to wonder if the people making these hand-wringing comments at Metro actually understand the service they’re in charge of. As it stands, I’m nervous about weekend Expo ridership once the extension opens; during rush hour it should be a good way to commute from SM to DTLA, but on the weekend, especially if you can split the fare with other people, Uber/Lyft should look a lot more attractive–door-to-door service vs walking to the train, waiting for the train, 45 minutes on the train, walking to your end destination; it could easily add up to an actual travel time of double the time spent on the train. The way to get people out of their cars and using Metro is (A) getting people to feel comfortable on the trains/buses, (B) more effective advertising (C) getting information out about how much time can be saved and even when the next trip is coming. Unfortunately, Metro buses don’t FEEL safe, even if they are. The safety issue may sadly be a mix of “white people don’t take the bus” fear or an actual lack of security, but it doesn’t help that most train stations aren’t staffed. Even if people’s fears are totally in their heads, these are still potential riders. Metro advertising is dreadful. Why don’t they get a billboard promoting the Expo Line, visible from the freeway, that says “Nap your way to Santa Monica”!? Instead it’s just a collage of images with a bike. Anyone who drives a car looks at that and goes “oh, that’s not for me. I need to get to work on time.” The approach needs to change to be more enticing, incentivizing, and straightforward. They do it on the trains (“take the Expo to all these great places”), but the advertising for the general population falls flat. Finally, it’s mind-boggling that I can be at the top of the Sunset/Vermont station and there’s no way for me to know if the train is about to come, or when the next train is coming, unless I walk down into the station! Bus stops should have low-end digital displays that update with real time info when the next bus comes. When is the 175 coming? It isn’t because it’s stopped running late at night? Getting this information out there would give people the sense that Metro is frequent and reliable. People don’t ride light rail and subways in Los Angeles so quit wasting billions of precious tax dollars that benefit only politically connected construction companies and union workers while the rest of us pay higher taxes for assets PEOPLE DON’T USE!!!!!!!!!!!!!!!!!!!!!!!!!!!!!!!!!!!!!!!!!!!!!!!!! We’re a one-car family. I take a Commuter Express bus to and from work. There is also a THEORETICALLY frequent Metro bus that runs from my office to my home; however after 7pm, sometimes it just doesn’t show up. I look at the Metro app, it says the bus is 3 minutes away, I wait five minutes, there’s no bus, I look back at the app, it says the next bus is in 45 minutes. And then I open my Lyft app and get a car home. CAPS LOCK AND MORE EXCLAMATION POINTS MAKE MY POST MORE CONVINCING!!!!!!!!!!!!!!!!!!!!!!!!!!!!!!!!!!!!!!!!!!!!!!!!!!!!!!!!!!!!!!!!! There are 330,000 passenger boarding’s on Metro rail every weekday, which is more vehicles than the 405 freeway through the Sepulveda pass handles. If your claim that those 330,000 passenger boarding’s are not actually people using rail, then it would be fair to say that there isn’t 300,000 vehicles going through the Sepulveda pass on the 405 everyday and that Los Angeles is wasting billions of precious tax dollars that will only benefit construction companies and union workers on the 405 freeway that people don’t use. Quit investing billions in 19th century trains that benefit so few. Technology is already enabling us to more efficiently and more effectively use our existing infrastructure and it will continue to help doing so. Technology is bringing innovation that are providing better private sector services and products people actually want, use and are affordable. Autonomous vehicles are going to entirely change the transportation landscape – perhaps making transit irrelevant. The future of transportation is not high cost transit solutions. You need to find a better source for transportation statistics. According to the California Department of Transportation’s Traffic Book the 405 carried 375,000. So one freeway in LA County carries more per day than Metro Rail. Anyone who really cares about people in Los Angeles County using public transportation would scrap every dime on Light rail and put every dime into the Metro Bus system, because that is the public transportation that 95% of daily riders utilize. Over 65% of those using light rail use a bus to get to or from their end destination station. Like I said in my first post, the only people who benefit from light rail are politically connected cronies and unions not Angelino’s who use public transportation. A fifth of Metro’s average weekday ridership in 2015 was by rail. That percent will likely increase with the Expo Phase II and the Gold Line extension to Azusa opening this year. The amount of Metro rail from 87 miles to over 104 miles. Its unlikely that voters would have approved the half-cent sales tax Measure R in 2008 if it was only for buses and highways. The big shiny projects are what get voters interested. Rail and highways have the appeal, but buses unfortunately do not. Buses traveling in mixed traffic have much less reliability and speed compared to dedicated transit only corridors. Creating transit only corridors will make transit use more attractive and competitive to traveling by car in the long run. Good thing nobody is investing billions in 19th century trains! Metro’s own ridership statistics directly contradict your post. Rail ridership decreased in 2014 from 2013, and went down again in 2015. Ridership is DECREASING on rail now increasing. Metro keeps pouring massive amounts of precious tax revenue into the boondoggle of light rail and subway in Los Angeles. Building 1.9 miles of subway downtown cost taxpayers $1.42 BILLION, need $130 more million, and is six months behind. If that money went into clean bus assets the city would have vastly superior public transportation and save hundreds of millions to boot. Taxes would be lower as well. Angelinos choose buses over light rail because rail doesn’t take them to their end destination. 65% of people using light rail have to catch a bus. I stated that a fifth of Metro’s ridership is rail and that this percent will likely rise when Expo Phase II and the Gold Line extension to Azusa opens this year. Using Metro’s weekday ridership of both rail and bus for calendar year 2015, rail is almost a fourth of total ridership. As rail is extended to more locations the percent of Metro passengers using rail will increase. Transit ridership is cyclical, it doesn’t move in a linear line. Ridership did fall on both rail and buses over the last two years. That does not mean necessarily that this will continue. None of the Measure R rail projects have opened yet. The only Measure R transit line in operation so far is a four mile extension of the Orange Line BRT. The Expo line may prove to have been over-sold in terms of expectations. Riding the line will certainly be a novelty but both end points, DTSM and DTLA are fraught with similar problems. The line is street running and will be reduced to a crawl. The train is going to feel slow and that sensation that you describe while riding a bus, of sitting in the same traffic as everyone else will become apparent. It may prove to be Expo’s undoing over the long term. Those streets aren’t going to get any less cars on them anytime soon. Joe, you’re right. Cleaning up the inside of the train should be priority-one. If the ride isn’t experienced as safe, comfortable and accommodating then Metro needs to get out of the transit business or Uber, Lyft and a bunch of other upstarts will have their lunch. I have a hard time believing Metro has the actual will and resources to make that change. By “high cost solutions” you’re referring to building/widening highways, buying cars, and building parking structures, right? The fact that they didn’t elevate the line, or at least the extension, despite not being able to get signal priority from Caltrans is hugely frustrating; but even if they had signal priority that doesn’t stop people from breaking down on the tracks, hitting the train, etc. It’s a very myopic decision, even more so because it’s not like there aren’t examples (e.g. Blue Line) to look at to find out how this works, and doubly frustrating because this is a “forever” fuckup. It’s going to be decades at a minimum before there’s any stomach to do this right, and likely not for a century when they’re deciding whether to rehab the line or to replace it. It might be a good commuter option, but I’m dubious of how much ridership it’s going to get on weekends. Plus it’s been set up to fail with all this nonsense talk of how it’s going to reduce traffic when it should have been sold as a way to get around DESPITE traffic. You must be talking about what 90-95% of us actually use everyday. 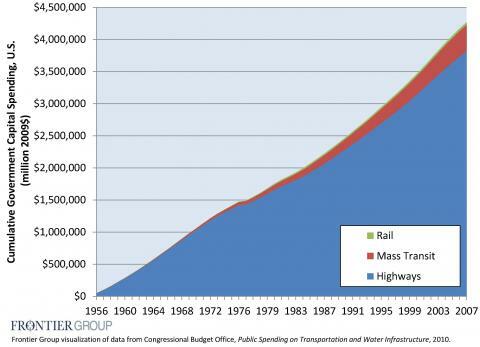 What’s the cost per trip and cost per passenger for roads vs high cost rail systems? Do the cost benefit analysis and figure out when you’re spending millions and billions, is it for a highly utilized asset or a low utilized asset. It only takes 4th grade math. Why not do both? The more options the better, including everything from autonomous vehicles to rideshare services to mass transit. Besides, those “19th century” technologies are widely used all over the world. The part I do agree with you however, is that mass transit should be less taxpayer reliant and should lean more towards self-sufficiency and even gradual privatization. No one cares if it’s done with private funds instead of taxpayer dollars going to serve the pockets of public employee unions. This is also perfectly doable; travel across the Pacific and you’ll see privatized mass transit being the norm over there, with cheaper fares and more efficient operations, far different from the inefficiencies of government run transit. like it is the norm stateside. BRT would be a better bet in a sprawl like LA County. Activists should focus on narrowing streets, reducing wasteful land use, raising parking fees to meet costs, etc. Look at the horrible public space at Olympic and Soto, with bikes, street vendors and a miserable bus stop squeezed together by an empty Sears parking lot. Look at the insane mess at E 4th St. and E 3rd Place. There is a level of insanity and incompetence here that can’t be dealt with by laying track. Somebody has to come up with a reason for living in these places. Once that’s done, transit will be easy. Most of the roads in Los Angeles are unused as well. Want to shut them down? Los Angeles has the most heavily used roads in the nation. Wisely spending money on the assets people use most just goes right over your head. It’s funny, as a New Yorker who visits LA occasionally, one of the huge differences for me using transit in LA has been the MASSIVE police presence compared to using transit in NYC. Maybe it’s just my luck, but I’ve been stopped by cops and asked to produce my TAP card maybe 3 or 4 times in LA? Even when I’d entered the system in areas where there are fare gates. Compare this to NYC, where the average person never sees a cop on the subway, and there are no Metrocard inspections ever (handheld readers don’t even exist) despite occasional turnstile jumping and farebeating at stations with unmanned booths. I would also note that Lyft and Uber in NYC are extremely expensive, whereas in LA they’re dirt cheap. The idea that you could just take an Uber with your friend for roughly the same price as a transit trip is never true in NYC. Actually most of the roads are just empty and about twice as wide as they need to be. Look at any neighborhood in LA and you’ll see it. We can be certain that billions invested today on roads and highways will not be spent on infrastructure that will be made obsolete by new technologies before the end of it’s useful life. Can we make the same statement about rail and parking structures? Rail transit in LA is primarily a commuting solution. Even if people drive less they will still want/need a car and still need a place to park their car when they are not driving. Proposals to change zoning regulations allowing new housing to be built with zero parking are mistaken. I live in Los Angeles. Try driving down Pico or Olympic. The argument can be equally just as said that do you think autonomous vehicles will change the landscape of heavily dense mass transit oriented cities around the world? If Toyota comes up with their own autonomous vehicles, do you think Tokyo will suddenly see everyone using driverless cars as opposed to the JR or Tokyo Subway system? Most likely, no. Tokyoites will still continue to use their mass transit system and no matter how convenient driverless cars will be, Tokyo did not develop their metropolis with wide roads so that 30 million+ of their population can all suddenly start using driverless cars to get around. Now LA is different, we focused our city development with wide roads fit for the automobile. But LA also has an increasing population where we have 10 million residents here. Are our existing infrastructure capable of transporting 10 million residents anywhere they go on just driverless cars alone? The answer to that is no also. That is why it is best to have both options on the table. Invest in mass transit and embrace autonomous vehicles. Depending on your work situation, some companies are required by the state of California to pay for people to not drive to work. If the company is over 50ppl I think and they pay for parking, they are required to pay people that are not using the parking benefit. So they might be making people pay for parking, but in a not entirely obvious manner. still need a place to park their car when they are not driving. They will? What if they don’t drive at all? Or what if, instead of owning a car, they use rental cars or taxis for situations when they need a car? That’s a cop out. There need to be objective metrics driving infrastructure resource allocation. Not wishful thinking and design ideology. So you’re saying that the fact that two roads are crowded at a certain time of day proves that all the roads in the county are always crowded. I don’t think so. There will always be both “objective metrics” and “Ideology” driving planning decisions. Ideology will drive which metrics you want to prioritize. You keep saying that Metro ridership will rise. Based on what? Your dreams and wishes? Metro Light Rail ridership has decreased the last two years in a row even as we speed hundreds of millions and in the case of a 2.0 mile subway connecting line over a billion. Please indicate a Metro Rail or Subway project not behind schedule or under budget. Choose anyone you want. Los Angeles has a crushing municipal debt. We haven’t had a balanced budget in years. We have a nearly 10% sales tax. So your saying that the roads in the city consistently found by the Department of Transportation to have the worst traffic in America are empty because you say so. You don’t think is sure and accurate statement. The traffic is bad on a few heavily used roads. That’s where the statistics come from. Most of the roads are still empty. You just don’t look. Whatever you say. I’ll just ignore the statistics, and my own experience that completely contradict your delusion. Gotta look at the cost per trip of various modes of transportation. If one is orders of magnitude more expensive and is also less flexible then all of the above doesn’t make so much sense. Withdraw subsidies, charge the actual price per trip and rail transit will wither and die. Look what happened to bus ridership when ares rose by 25 cents. What would happen if commuter fare were raised by $5? A private model is a conservstive fantasy. Especially when your statistics are irrelevant to the conversation. The question we are addressing is not whether certain roads a re passable, or even how long it takes you to get to work. The question at hand is how heavily the existing street network is used. And since LA County is covered with empty residential streets that never carry at anything approaching capacity, it’s pretty clear that I’m right. You just have to look. The cit did, and that is why they plan to convert vast areas of unused pavement in to bus and bike lanes. It’s down because people are taking Uber and Lyft. It’s better than the bus and cheaper than a taxi. If Metro wants to increase ridership then LA County cities need to work closer with Metro in re-zoning areas next to mass transit stations for higher density. It’s pathetic to see all these new low-stumpy projects springing up next to Metro stations that could have been much denser. Projects near Bergamot station have been downsized, along with the Casden West LA project, and Chinatown’s College Station project. The real culprits are an outdated zoning code and the NIMBYs who thrive on them to keep projects low-scaled to fit their suburban utopia. The result is even more congested traffic on our freeways. We need more taller and denser TODs next to Metro Stations. It will do far more in alleviating the first/last mile connectivity issues than planting more parking lots, which we don’t need more of. Who was riding the busses? In many cases the poor including illegal immigrants. They now have driver’s licenses. An unintended consequence of social justice?